If your testosterone, free or total, is elevated by 10%, it doesn’t mean that your muscle mass will increase by 10%. What the science on hormones tells us is that the these markers are great indicators of fatigue, and not muscle synthesis (repair or building of muscle). A better way of thinking about this is to consider trends in your free and total testosterone as hinting at fatigue, rather than growth. Pro Tip: It’s ok to fluctuate within the "optimal zone," but when chronically low, or below the zone, you should start to think about how lifestyle factors like sleep and overtraining can be contributing to the problem. Use a sleep tracker and commit to hitting 7-8 hours of quality sleep before blaming a workout program. Cortisol, like some biomarkers, is influenced by one’s circadian rhythm so it will rise and fall during the day. A practical approach to testing is to test consistently at the same time each morning for a simple summary of balance between stress and rest. Cortisol is naturally higher in the morning, but look to see if your values are constantly skyrocketing and if it corresponds to lower testosterone numbers. Pro Tip: Don’t become overly concerned about one high cortisol with low testosterone test (free or total testosterone), but watch the trends to see if you need to make changes — like changing the frequency or volume of your weight training. 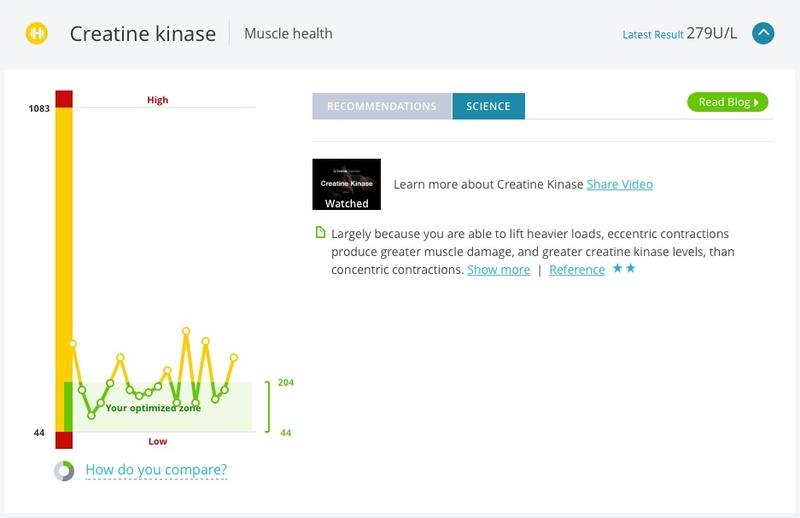 The biomarker Creatine Kinase (CK) is a key indicator of physical and mental strain that shows how much muscle breakdown is in the blood stream. When heavy training overloads muscle, the tissue leaks out enzyme CK, and blood tests detect the “micro trauma." It’s perfectly normal to be outside the optimized zone right after training (which is why our testing guidelines suggest not training the day prior to a blood draw), but if one has an extremely elevated number followed by a poor testosterone-to-cortisol ratio, it’s likely the training is causing a poor balance of rest and training. If cortisol and testosterone numbers are off, but CK is in range, it may not be the training program that's the issue, but rather, lack of recovery outside the gym. Pro Tip: The enzymes AST and ALT are mainly found in the liver, but they are also found in other systems of the body. When those are elevated along with Creatine Kinase it’s a good idea to think about reducing training intensity and volume to create enough room to improve — but not too much that recovery is delayed. In the research it’s unclear how the liver helps recovery after training, but the biomarkers are great reference points for those performing heavy workouts. Testing with InsideTracker's new, High Performance panel can be done at nearly any time, as fasting is not required. 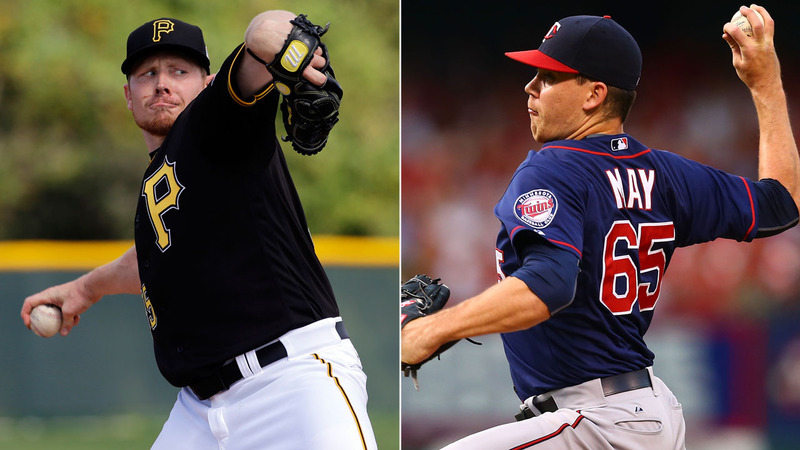 That flexibility leads to some creative options. Several clever ways to gain a better understanding of how much strain you're putting on your body or how fast you recover, can be teased out by carefully scheduling testing. Any time is a good time to test with enough interpretation, but testing at key periods of training can tell you if your workouts are working. Pro Tip: Testing after the heaviest training time to see what type of stress one is subjecting their body to is a good reference point. In addition to the heavy training, testing the end of a recovery week or similar can also tell you if you're ready to go hard again. Test different milestones in training and compare future sessions to the past for a better perspective. The biomarker Vitamin D is often seen as an indicator of bone health in elderly women and as general nutrition for the average Joe. Strength trainers often neglect Vitamin D and need to remember that muscle performance is connected to it. Vitamin D is actually a hormone, but it’s not about getting to the optimized zone — it’s how long one is training within the optimized zone that counts. Early gains in strength and/or size come easy, but higher levels of performance require many more factors to be aligned. 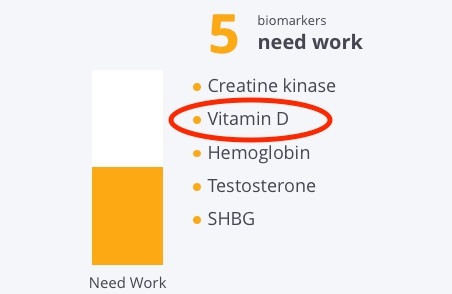 Pro Tip: Don’t underestimate the importance of repeat-testing with Vitamin D. Assuming that the daily vitamin will work is convenient, but inconsistent outdoor access and small nutritional changes can easily bump one out of a rather tight optimal zone. With the new High Performance panel, InsideTracker cuts straight to the key biomarkers that help push training harder and correspond to better recovery. Strength training is a repeated cycle of breaking down and building up muscle, and using blood analysis helps everyone — from the casual fitness enthusiast to the elite athlete get more out of their workouts. Lips P, van Schoor NM, de Jongh RT. Vitamin D status and nutrition in Europe and Asia. Journal of Steroid Biochemistry and Molecular Biology. 2007;103(3–5):620–625. Tripkovic L, Lambert H, Hart K, Smith CP, Bucca G, Penson S, Chope G, Hyppönen E, Berry J, Vieth R, et al. Comparison of vitamin D2 and vitamin D3 supplementation in raising serum 25-hydroxyvitamin D status: a systematic review and meta-analysis . American Journal of Clinical Nutrition 2012;95:1357–65. De konig EJ, van Schoor NM, Penninx BW, Elders PJ, Heijboer AC, Smit JH, Bet PM, van Tulder MW, den Heijer M, van Marwijk HW, Lips P. Vitamin D supplementation to prevent depression and poor physical function in older adults: study protocol of the D-Vitaal study, a randomized placebo-controlled clinical trial. BMC Geriatrics. 2015 Nov 19; 15:151.